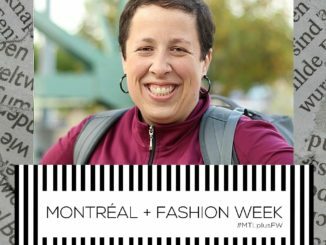 Montreal recently held it’s very first plus-size fashion week under the name Montreal + Fashion Week during the May 20-22 weekend. 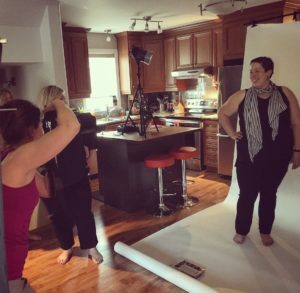 Kudos to Emily Roy & Nadine Moore, the two ladies behind the whole thing, who also happens to be behind Catapulp, a Montreal-based plus-size fashion boutique opened since 2013. Though fashion is a topic I hardly mention on this blog, I have to command the very inclusive nature of the event, and not necessarily because I was a guest speaker at the event (click here to find out more about “Pack Small-Think Big!”), but because the event also explored not only plus-size fashion and different aspects of well-being for plus-size women, including a yoga demonstration by Yoga Rondeurs (in French only) and a bra adjustment workshop with Debbie Donnelle, owner of Lingerie Debra (never seen someone who seemed as comfortable in her bra as the lady who was modeling the different types of bras during Debbie’s presentation). 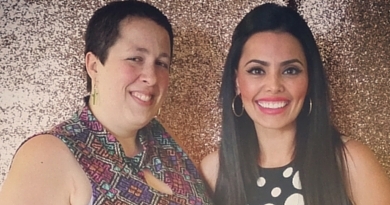 It’s also pretty awesome that the organizers got major plus-size models like Rosie Mercado and Joby Bach to walk the runway on the fashion show that took place on Friday night, but also that they were both willing to participate to this first Montreal plus-size fashion event. Rosie spent the whole weekend at the sale expo with the team from i.b.b.i., and she proudly represents the brand. (She also performed an impromptu speaking, after reigning Miss Plus Canada Sarah Taylor’s speech on self-acceptance, about the importance of finding and pursue a purpose.) A cheerful, caring and generous woman with an amazing spirit… It’s been an honour to meet Rosie and have a chance to chat about travel with her! Not only was I wearing a DRESS all weekend, but I got to meet & chat with the amazing model Rosie Mercado! 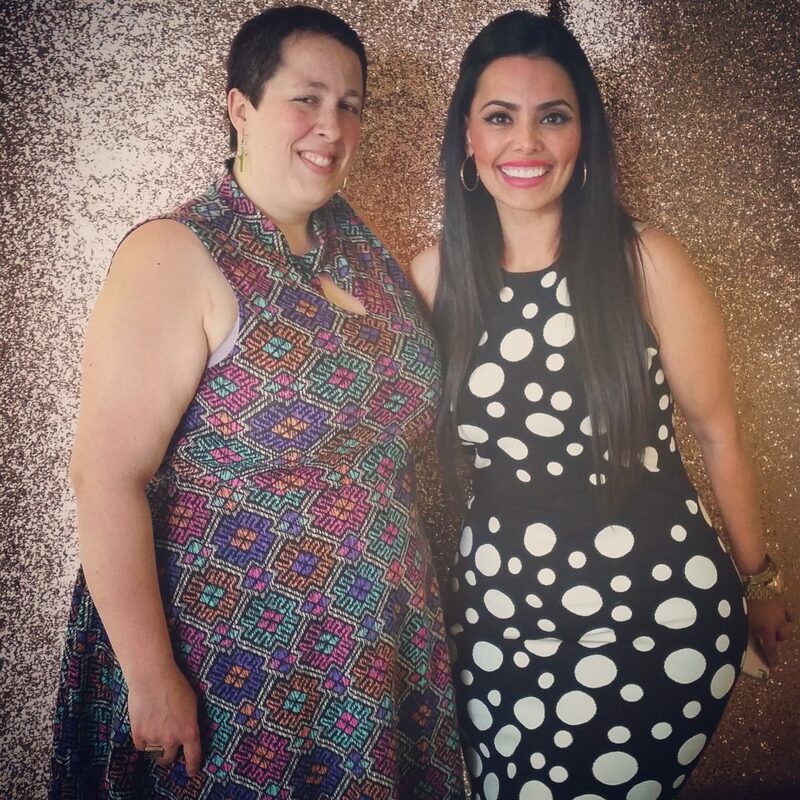 The Montreal + Fashion Week as an amazing for me to network and meet fellow plus-size entrepreneurs and influencers. Amongst them, Marie-Lyne Desbiens, the woman behind Bella +. Catering to the needs of active plus-size women, their clothes are created with sport and comfort in mind. Marie-Lyne herself is quite a sporty person, practicing spinning, running and training for triathlon. That weekend was the first beautiful summer weekend (on top of being a 3-day weekend). This might have affected the turnover of visitors. But I’m so grateful for having a part to this premiere event in Montreal! After all, it was the 1st bilingual plus-size fashion week in Canada and the 1st one in Quebec!